On September 19 1961, Betty and Barney Hill of Portsmouth, New Hampshire claim to have been abducted by aliens.Scientists at the time discredited a map drawn by Betty which outlined the exact location of where she claimed the extra-terrestrials originated. Experts claimed there was no constellation similar to the drawing and that it bore no resemblance to any known formation at the time. Now years later, one statistician has remarkably argued that the unusual alignment of key sun-like stars in the drawing, which mirrors the Zeta Reticuli could never have happened by chance and that Betty WAS a victim of an alien abduction. Just south of Lancashire,New Hampshire, Betty and Barney claim to have seen a strange, oval craft hovering above them. Zeta Reticuli constellation mirrors that drawn by Betty. Then, they spotted a group of ‘humanoid beings’ watching them from behind a curved lighted window in the craft. Their last conscious memory was of the same creatures standing in the middle of the road, blocking their path.The next thing they knew they were pulling up at their house in Portsmouth. Over three hours of their journey was unaccounted for with neither of them able to remember the details of that night’s events. Betty, speaking before her death in 2004, said in an never before seen interview: “I was taken on board. Barney was taken into one room and I was taken into another. The one who did the testing we called The Examiner. “First they put me on a stool and they checked my eyes, ears, nose, throat. They put me on a table, and said they wanted to check my nervous system. Betty also remembered a conversation with ‘The Leader’ in which she asked where the extra terrestrials had come from. 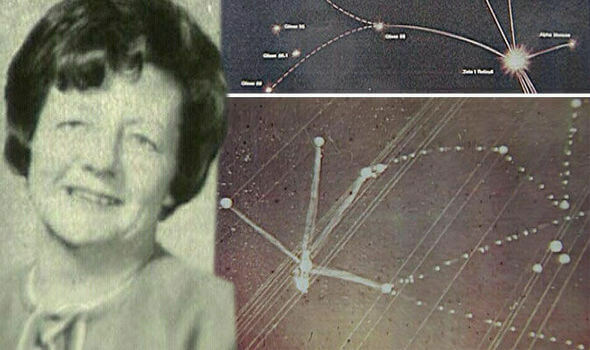 “I said ‘I know you’re not from this planet but where are you from?’ He showed me a star map indicating where he came from’.Under hypnosis, Betty drew the map which consisted of twelve prominent stars connected by lines and three lesser ones that formed a distinctive triangle. She said she was told the stars connected by solid lines formed “trade routes”, whereas dashed lines were to less-traveled stars. David Saunders, a statistician who had been on the Condon UFO study, argued that the unusual alignment of key sun-like stars in a plane centered around Zeta Reticuli was statistically improbable to have happened by chance from a random sketch and that Betty was in fact telling the truth. He claimed that only aliens could have given her the information. The official AF UFO report. Other puzzling evidence surrounding the claimed abduction at the time include Betty’s dress being torn, and covered in a strange pink powder which was later confirmed as ‘not being of any organic origin’. There were shiny concentric circles covering the boot of their car and when a compass was placed next to them it would spin uncontrollably.Later, after the ‘encounter’, the couple began to experience terrible nightmares and suffer symptoms of severe stress. Barney became so ill, they sought medical advice. The couple were examined and put under hypnosis by psychiatrist, Dr Benjamin Simon who made an astonishing discovery. When Betty and Barney were regressed to the missing time and alleged moment of abduction, they were able to clearly recall all the details, serving as further proof of the couple’s story. Another incredible picture to emerge from these sessions occurred when Barney sketched his abductors – creating the first known image of an alien.Later, a 3 dimensional model was created by a local artist. Barney died of a cerebral hemorrhage on February 25, 1969, at age 46. Betty believed this was partially due to the terrifying experience of his alien abduction. Betty Hill died October 17, 2004, having spent the intervening years proving beyond a doubt that she was visited by aliens from a distant planet.